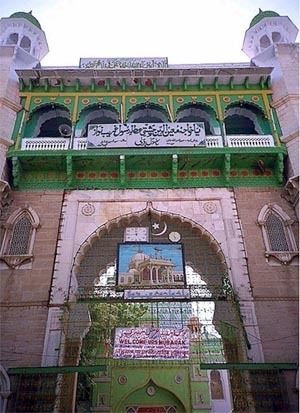 High entrance that was erected by Mahmood Khilji or one of his successors. 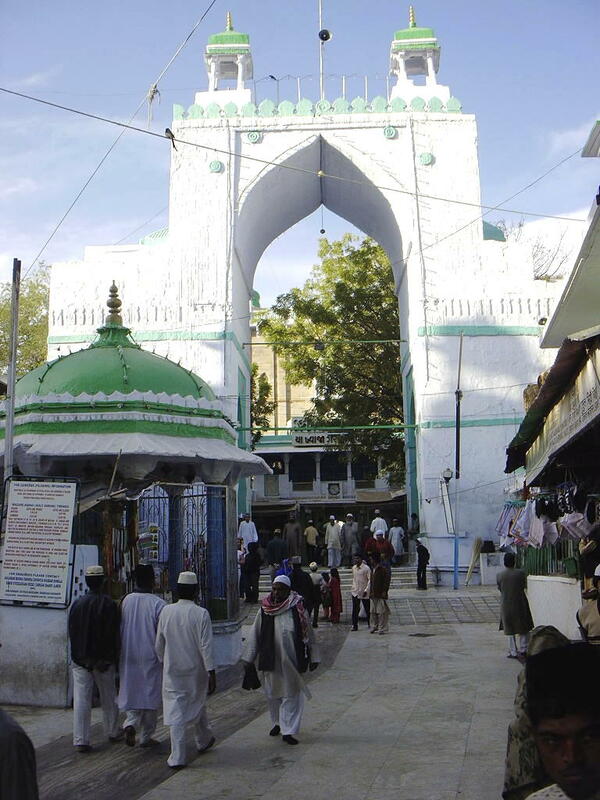 Before the commencement of Urs Sharif a flag is hoisted on top of this gate with grand ceremony on the 25th Jamadiulsaani for ushering the 'Urs' of Khawaja Saheb, which starts from 1st of Rajab (The 7th month of lunar Calendar). 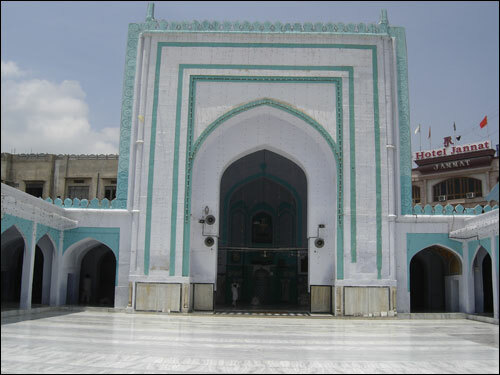 On the west of the Saham Chiragh stands the magnificent building of Samakhana or Mahfilkhana (auditorium with darbar hall) which was built by Nawab Bashir-ud-Dowla Sir Asmaan Jah of Hyderabad Deccan in 1888-91 A.D. This spacious hall is 46 feet square with a gallery of 14 feet running around it. 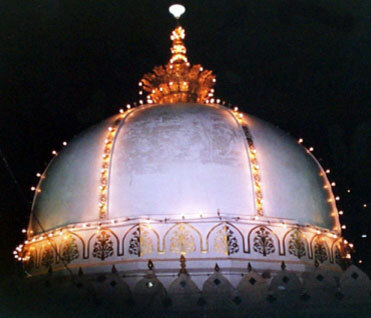 It is used for 6 days only during the annual Urs for religious ‘Mahfils’ in which Qawwali is the chief item of programme commencing at 11 P.M. and ending with Fatiha (a relifious ceremony) in the early hours of morning at 4 A.M. 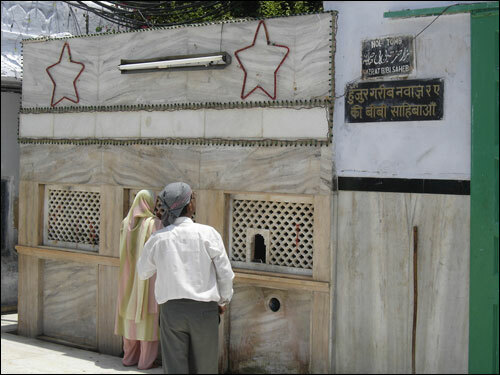 The Mazar of Bibi Hafiz Jamal, daughter of Khawaja Sahib, is situated to the south of the Shrine. 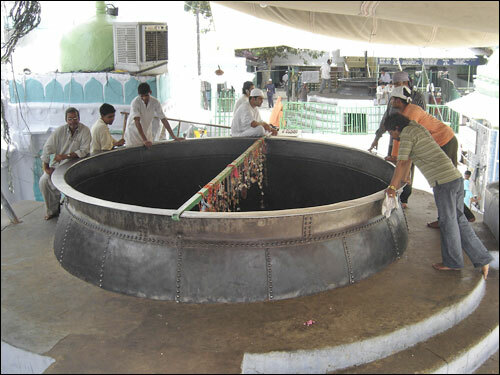 There is a small dome with a kalas on top of it. 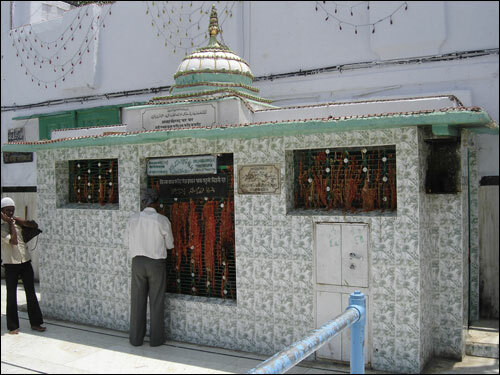 The doors of this tomb are plated with silver. 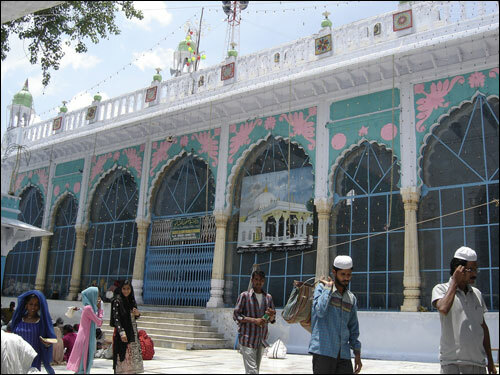 The place where Khawaja Sahib stayed for a few days, when he came to Ajmer for the first time, has now been turned into a mosque called Aulia Masjid. 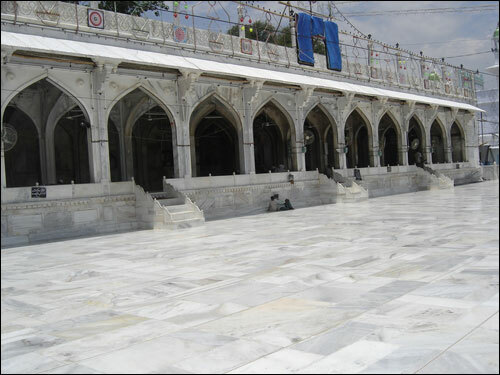 It is made of white marble. 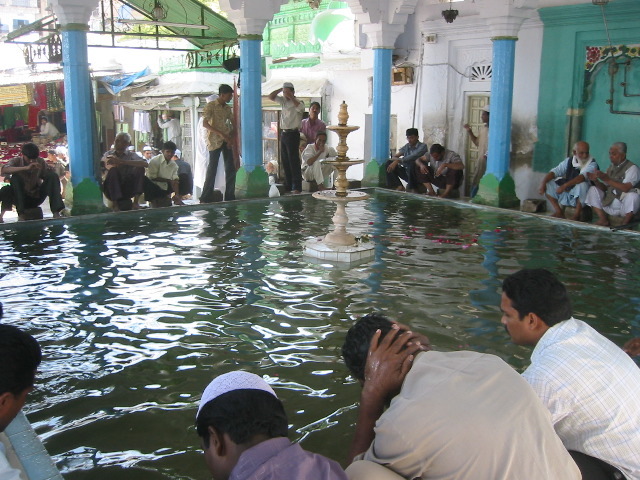 Devotees use it only for recitation of Holy Quran and thanks giving prayers. 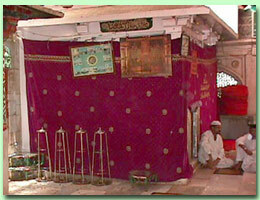 Is situated between Jama Masjid and Sandali Masjid in the premises of Hazrat khwaja Muinuddin's Dargah at Ajmer. 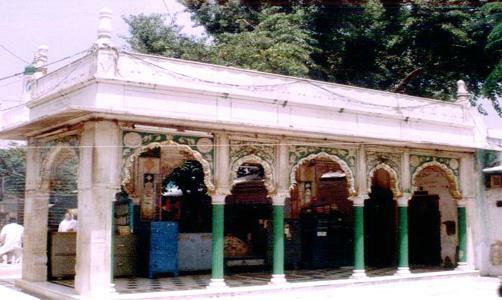 Along the left-hand wall, in the background of the Sandali Masjid there is a small gate which leads down to the under-ground cell in which Hazrat Baba Farid remained in a chilla (secluded prayers) for 40 days in spiritual communion with the Holy Saint of Ajmer. 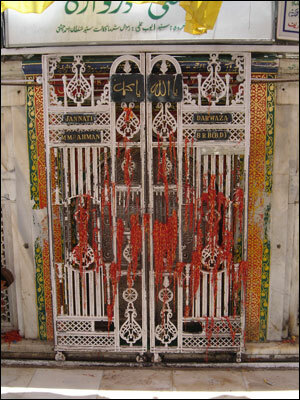 This gate is opened for public Ziarat (visit) on the night of the 5th of Moharram (the date of Baba farid's death) every year when thousands of pilgrims visit the place from all over India to seek his spiritual benediction. 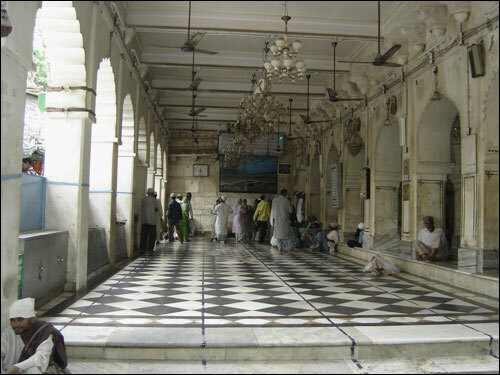 This Mosque was build by Mughal Emoeror Akbar the great. 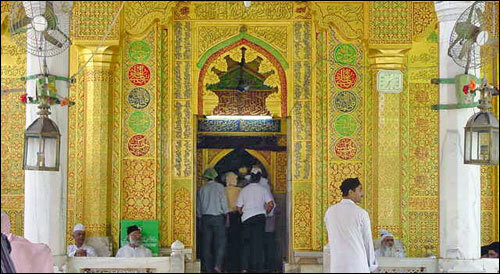 Who came to Ajmer from Agra to ask for a son to Khawaja Moinuddin Chishty R.A. When he got son he build this Mosque.